Improve the health of your horses to achieve and maintain overall WELLNESS. 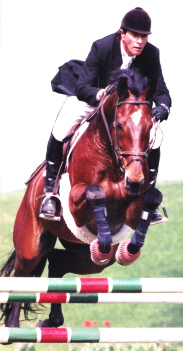 Provide your horses with the necessary VIGOR to make a difference in today’s competitive environment. Reach new heights in ENDURANCE that will be second to none. 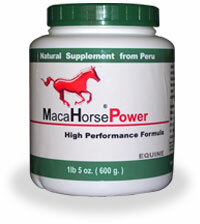 Horses consuming ™Maca Horse Power improve their physical and mental disposition. • Charges the body with concentrated antioxidants, for fast recovery, and healthy joint and muscle function. 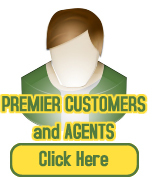 • Accelerates natural healing by increasing circulation and transport of healing nutrients. • Antiaging and breeding aid. Maca powder, Maca extract, annatto, flaxseed, cat's claw extract, purple maize extract. Feed 1-2 scoops ( 1 - 2 oz. ) per 1,000 lb. horse. Mix with dry feed for horses in regular exercise or reproduction. 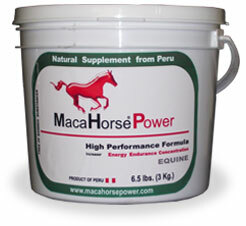 A pure all natural product from Perú for maximum physical and reproductive performance in all types of horses.